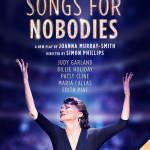 Bernadette Robinson makes her European premiere at Wilton’s Music Hall in London from 21st of March to 7th of April 2018. Directed by Simon Phillips (Priscilla Queen of the Desert, the Musical and Love Never Dies) this highly acclaimed one-woman play with music was written especially for Bernadette by award-winning playwright Joanna Murray-Smith. See our full production website details here. Here’s what Barry Humphries has to say about Bernadette Robinson!